Uchida Kisaku is a revolutionary. He is a subversive radical with a fully realized philosophy and agenda bent on upending the established order. 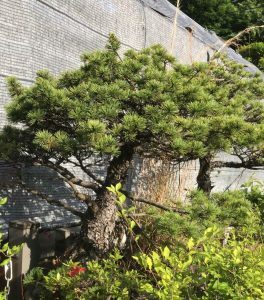 Well, the established order of bonsai that is. Like every good thing that has happened to me in Japan, I met Uchida Kisaku by happenstance, by luck really. I was searching for my children who had gone to a park whose location I was unclear of. Using Google Maps, I chose a site, thinking that was where they might be. They were not. If this were Brooklyn, I probably would have been concerned; however, in Tokyo, I was not worried a bit. 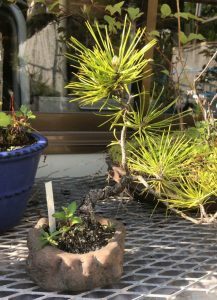 Across the street from the empty park, I noticed a lush plant nursery — a number of its wares set out in front, a leaning pine tree framing the entrance. What was offered was strange to me. No extravagant flowers, no herbs, no small tomato plants. 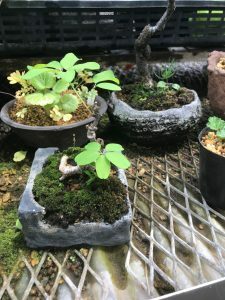 Instead, there were grasses, a beautifully arranged trio of Lily of the Valley, some wild-looking miniature bushes, a tiny Japanese Maple and what looked like a strange and evocative living sculpture of moss and grasses enclosed in a beautiful piece of ceramic pottery. I walked inside to a veritable bounty of botany, a tangle of greenery — wild grasses, water plants, mosses, delicate strands of vine, a sectional stick-like plant that I remember growing near the banks of Lake Michigan, carnivorous bog plants, tiny yellow flowers, Jerusalem Palms, craggy bushes sporting brilliant red blossoms. 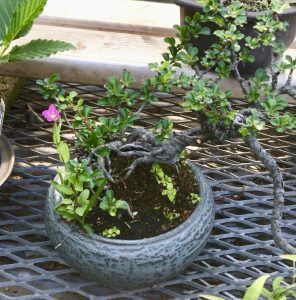 Some were sold in plastic pots for re-potting and others were planted in a variety of Japanese pottery and craggy boulders of volcanic rock. As my eyes adjusted to the abundance, I began to look closer, to detect an order, a pattern, a firm aesthetic over-seeing the initial sense of chaos. The potted plants were rife with a sense of harmony, a tiny slice of nature in a new context, both cultivated and wild. They seemed like bonsai to me, but bonsai with a sense of freedom. 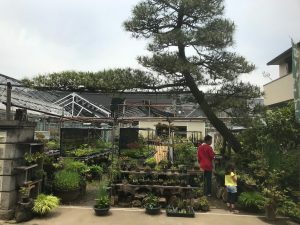 I wandered deeper into the nursery and found a quite dapper, neatly dressed older man, fragrant with the scent of Bay Rum busy at work in one of the green houses. He seemed almost surprised to see a customer, but was warm and welcoming. I apologized for my lack of Japanese, but was able to understand some of what he was saying, and made him aware that I was living locally in Heiwadai. Somehow, I felt a connection beyond language. I was understanding his eye, his way of seeing. The next day I made my wife come to the nursery with me. Ostensibly, I wanted to find out if there was anything special I needed to know about caring for my new plant; but really, I wanted her to see how wonderful it was and also help translate so I could find a little more about the owner. My wife was bemused by my enthusiasm as I rooted among the greenery, showing her how beautiful, how unique I found everything. 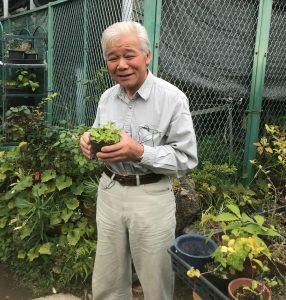 We found the owner on the steps of his house — a lush garden of trees, vegetables, and mossy rock spreading away from the path. He was thrilled to see me and began to speak at length about his work. He was not unknown. He had written a book, used to give classes and even appeared on television a few times. He was in thrall to nature — to the stories it told. He reveled in the details — the tiny tendrils extending from moss, the first delicate leaves poking up from the dirt, the way a dying flower gave birth to new shoots, to new buds. 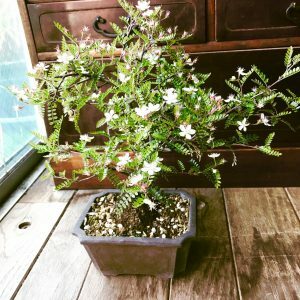 He was so happy that I had come the day before and recognized that the tree I bought belonged to only me — that it reflected some aspect of my being. 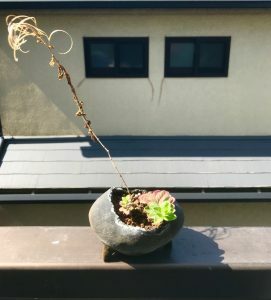 He said I should not take too much care of my bonsai — I should let it grow and change with the seasons. He picked up two bonsai and held them out to me. “What do you see?” he asked. 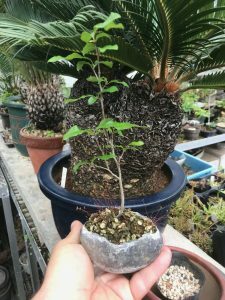 The first was a small persimmon tree enclosed in a small raku vessel. The slender trunk grew up from a mossy base, delicate red spores dancing in the wind from the green mat. I told him I found the details intriguing, how the verticality of the persimmon contrasted with the heavy pottery and earth-bound weight of the moss; how the two contrasting elements were accented by the almost fluttering delicacy of the red tendrils. The next was a shoot topped with curling blades, almost like wood shavings. It appeared to be dead, or dried up. At its base crept two new plants, the tiny leaves of a third just breaking the soil. A subtle emerald spot of moss sprouting in the rich earth all of which were encased in an egg-shaped pot, the opening mimicking the cracks of a shell. I said it was a story of motherhood, of family, of the cycles of death and life. I was surprised as to how the details were speaking to me. Uchida-San nodded and said he would like to give me one as a present. Tough choices. I reached for the egg-shaped one, realizing that although it didn’t have the immediate impact of the persimmon, it spoke to me in a deeper way. 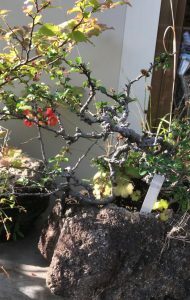 Uchida-San told me that traditional Bonsai makers would trim away the dead sections, remove the accidental growths, storm the very choices that nature decided upon. Replace freedom with iron-bound will. This is what Uchida-San fights against. On our way home I realized I was seeing differently, my senses almost hyper-aware. The clover along the curbside had new meaning, the wild orange poppies that swayed in the empty lots seemed more graceful. I was seeing the details in the weeds, visualizing how the accidental beauty of those grasses and thorny leaves would be accentuated when taken out of context. It was as if the beauty of everyday world spilled out from a container that I had kept lidded. Understanding another person’s aesthetics is really a high level form of empathy. You are seeing through someone else’s eye, hearing what someone else hears. It is a deep connection. I have been blessed to have been raised by two people with uniques sets of aesthetic values. My mother is an artist. A painter, a graphic artist, a photographer who is now primarily working in ceramics. From the earliest time, I learned to see as she did, to understand her abstractions, her still lives, her choices in terms of photography. My father loves furniture, design, interiors and architecture. He taught me to see beauty in function and how a room could become your own with objects and lighting and chairs. The two of them gave me a sense of what taste is and what it means to develop your own sensibilities. When it came to music, I was lucky to own a Jamaican record store and really learn about other people’s taste. Jamaican music is filled with tiny sub-genres and the people who love them are very serious. By really listening to what my customers liked, I learned to understand their taste when they asked for “deep roots music” or the uptempo early reggae of 1969. By focusing, I could eventually hear what they were hearing, and it made me a better person for it. On a visual level, I have had two people change my sensibilities, to enlarge my scope and understanding. The first was my friend tall Josh. He saw beauty in minimalism and saw the rhythm in skyscraper windows where I had seen none. By understanding what he saw I came to appreciate a whole new realm of architecture and beauty — I saw echoes of Modrian in buildings that I had formally dismissed. The second was Mister Mort and his eponymous blog and Instagram feed. I had never really looked at fashion, and his celebration of everyday clothing — from the tattered collar of a well-worn shirt, to the sartorial splendor of the old men roaming the streets of Chinatown opened me up to a whole new way of seeing. And now Uchida-San with his uncompromising vision of nature, of botany. He has shared with me a gift of unmeasurable value by altering my sense of aesthetics. It is a gift whose dividends will be paid out for the rest of my life as I now see the world in a different light. It is a new way of seeing that binds me, like lichen to rock, to my new home.